“Yarrow has been long recognized as a protective, healing plant. Achilles, after whom yarrow (achillea millefolium) is named, was reputed to have used yarrow to heal wounds on the battle field. 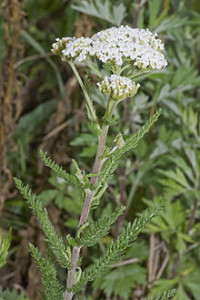 In fact, yarrow has a long-standing reputation among herbalists in Europe, North America, and Asia for its ability to slow and stop the flow of blood. Part of yarrow’s magic is the ability to slow the flow of energy going to a wound to a rate that aids in healing. Yarrow magic is the magic of intentional restraint. Intentional restraint, one of yarrows lessons and skills, is about recognizing that wounds, especially deep ones, benefit from slow and carefully protected healing. Yarrow reminds us to give energy to our healing process, but not to allow the energy to overwhelm us. Likewise, yarrow reminds us to protect ourselves and our vulnerable places so that they can heal. What has captured my interest in Yarrow is the magical, energetic qualities of this wonderful herb. I know that with my creative and artistic projects, I am quick to plunge right into them in such a way that I can burn up what energy I have. Sometimes I can get so involved in a project that I dry up my well of creativity and forget to fill it back up with creative play as well as hard work. I like that Yarrow can remind me to slow down my mad flow of energy and pause and focus for greater clarity in my purpose. I am one that keeps draining my well without taking the time to refill it. I know I need to slow down and have a steady flow into my creativity as well as taking out scoops from my well. We all need to draw energy and creative juice from our enviroment and as Julia Cameron says, we need to have artist dates where we can refill our wells. How is your creative well? Is it stocked up with much water, fish and plants? Please note you can visit http://www.thepracticalherbalist.com/ for more information about Yarrow and other herbs.